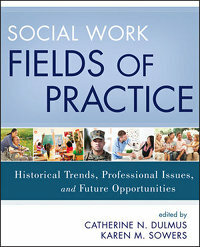 Written by a team of experts in their respective specialties, Social Work Fields of Practicefeatures a comprehensive overview of contemporary social work practice, discussing historical trends and demographics, professional issues, ethics, and diversity for each practice area. Both traditional areas and new fields are considered from various perspectives, including the clinical, ethical, cultural, legal, theoretical, and technological. • social work practice with immigrant and indigenous populations.